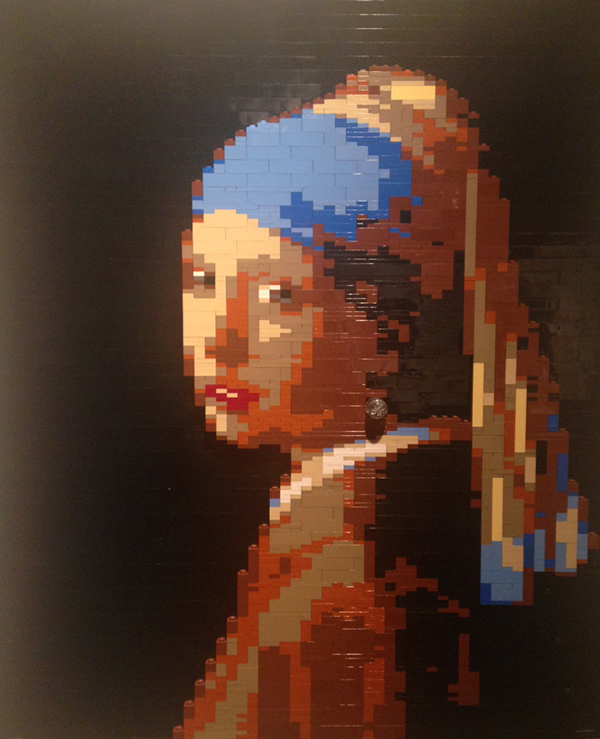 Artist Nathan Sawaya�s recreation of Johannes Vermeer�s Girl with a Pearl Earring brings the figure out one brick layer from the background to create dimension. He used a clear, round LEGO piece for the earring. 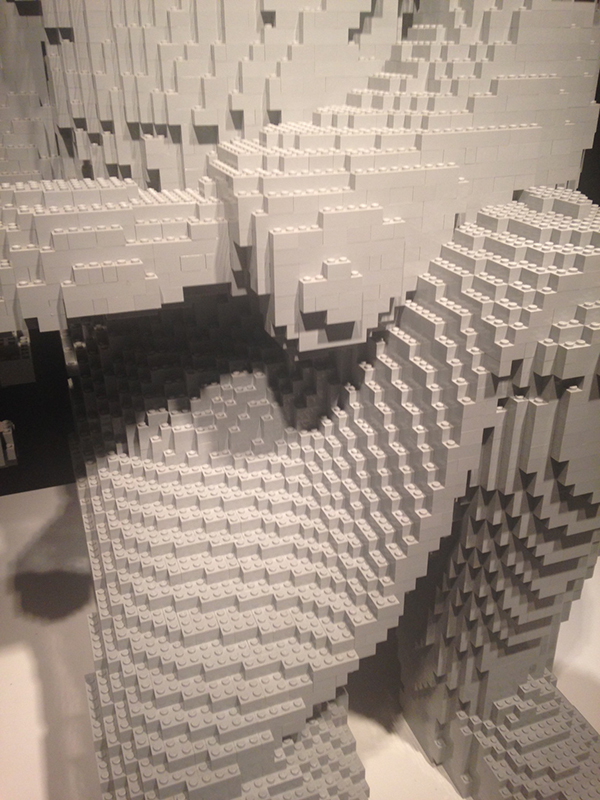 There are 1,694 LEGO bricks in the composition. Nathan Sawaya is an artist unlike any other. 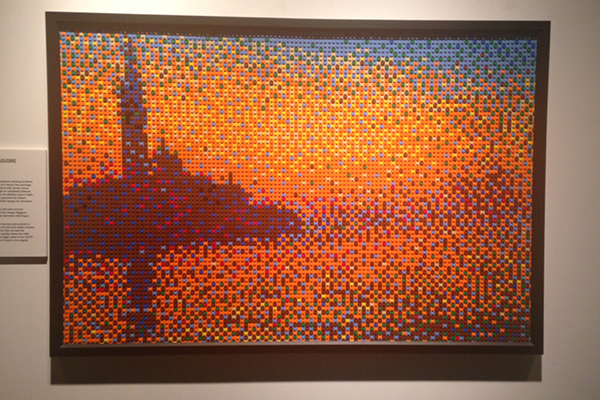 Instead of pencils, paint, canvases, and brushes, he uses LEGO pieces � the small plastic interlocking toy building bricks made by Denmark-based The Lego Group. Sawaya, who splits his time between studios in New York and Los Angeles, sees the toy bricks as a genuine medium for creating art, and more than 100 examples are on view on the second floor of the Rotunda in Quincy Market at Boston�s Faneuil Hall Marketplace until January 11, 2015. Also, The Art of the Brick: A Life in LEGO (No Starch Press, San Francisco, $29.95), a book documenting his achievements with behind-the-scenes details about his process, was released last week. Sawaya was trained as an artist and used art as a creative outlet after his grueling workday as a corporate lawyer. He began playing with LEGO pieces, a favorite from his childhood, and it all �clicked� for him. He started creating the sculptures that have allowed him to achieve the quintessential lawyer-turned- artist status of which he always dreamed. There was even a Jeopardy category the television quiz show dedicated to his work. In the Boston exhibit, there are recreations of famous paintings � art history buffs will recognize works mimicking the art of Kazimir Malevich and Paul Klee and other notable artists � along with inventions of Sawaya�s imagination, which mostly revolve around the human form. Either created three-dimensionally or with a relief method for a flatter result, Sawaya�s artwork is quirky, impressive, and, above all, playful (kids especially love it). But it�s the intricacy involved in the execution that�s absolutely stunning. How does Sawaya recreate a three-dimensional Moi figure from Easter Island to scale? Or get the illumination of the layered colors of Vincent Van Gogh�s Starry Night just right with solid-colored pieces? 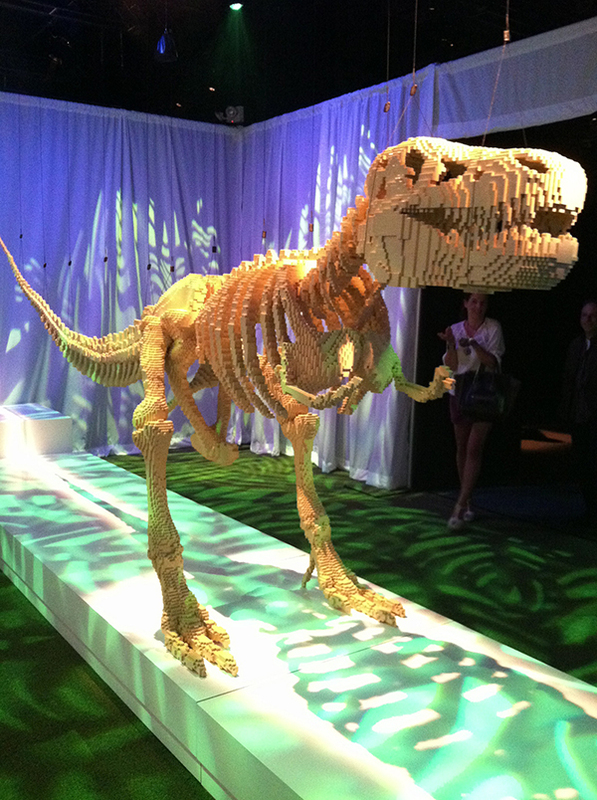 And how does the massive LEGO skeleton of a tyrannosaurus rex involving more than 80 thousand pieces not fall over? 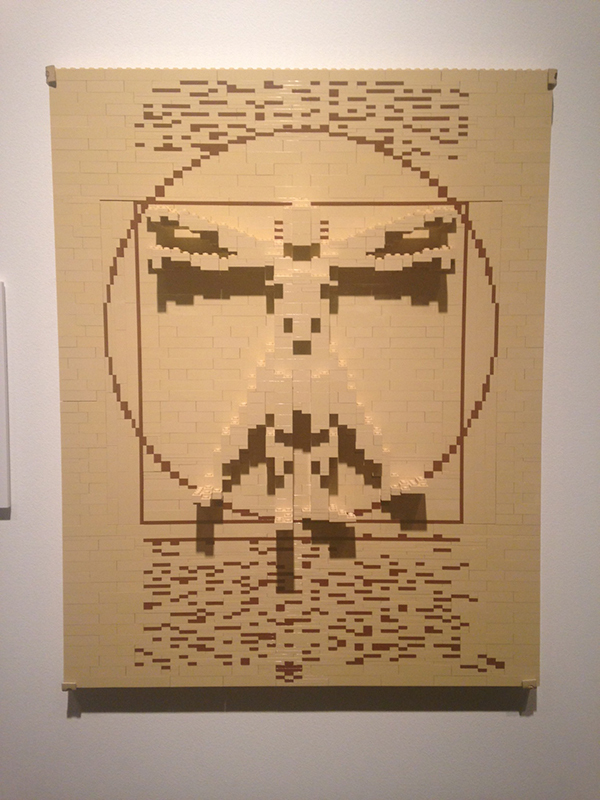 Courtesy of The Art of the Brick. Sawaya�s work is testament that inspiration for art in design is indeed found everywhere, and with anything. 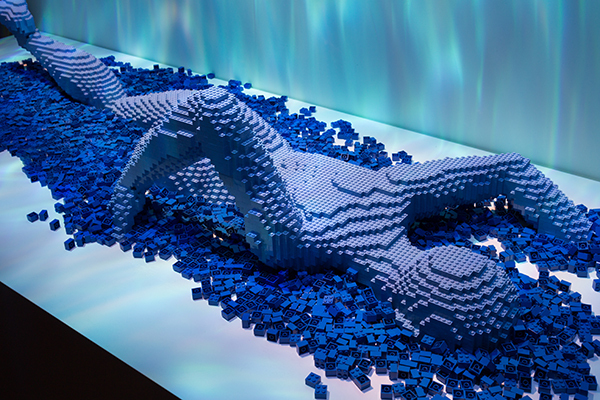 For information, hours, and tickets for �The Art of the Brick� exhibition, click here. Here are a few of our favorites from the exhibit. Leonardo Da Vinci�s Vitruvian Man is created with a three-dimensional method for the figure, and darker-colored bricks for the circle and square. 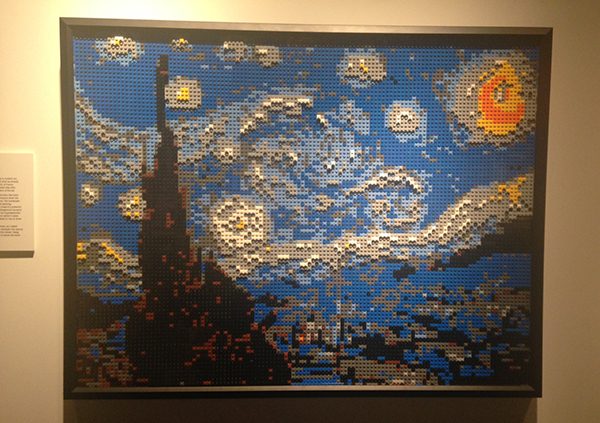 This version of Vincent Van Gogh�s Starry Night has depth and color � and 3,493 bricks. An interpretation of Claude Monet�s San Giorgio Maggiore at Dusk begs to be touched as its 3,708 brightly colored bricks evoke vibration and depth, though they are all placed at the same layer. 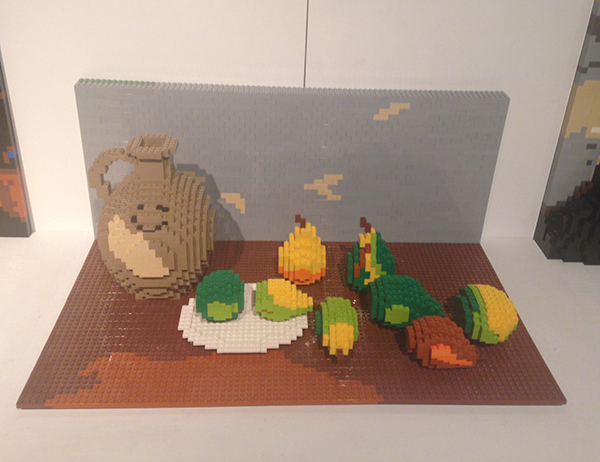 Paul Cezanne�s Still Life, Jug and Fruit is spiritedly reimagined in 3D. The beauty of layering bricks is seen in this close-up of the Chinese Kneeling Archer statue recreation, made to scale with 11,200 bricks. 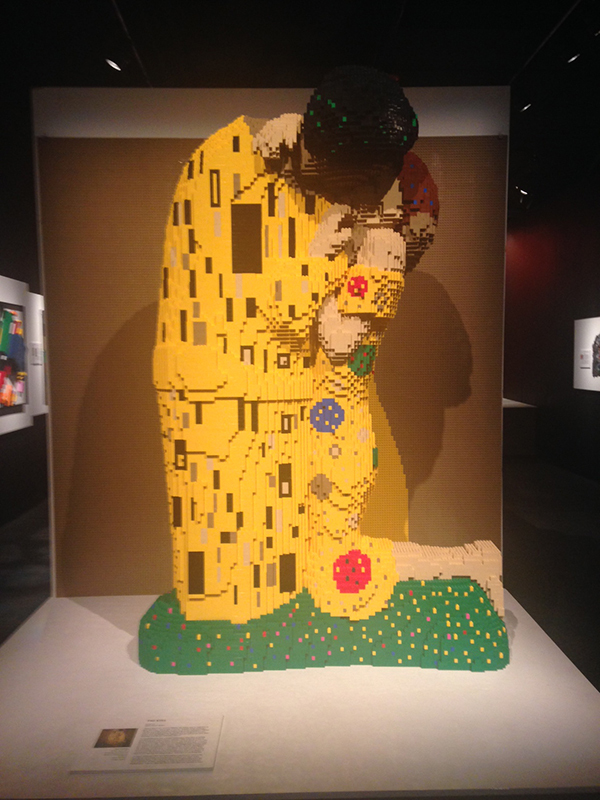 Sawaya also created Gustav Klimt�s The Kiss to scale with 18,893 bricks, successfully making the two figures feel like they are truly embracing each other. A fun element of turning a two-dimensional painting into a three-dimensional LEGO sculpture, he decorated the back of the clothing to match the front. 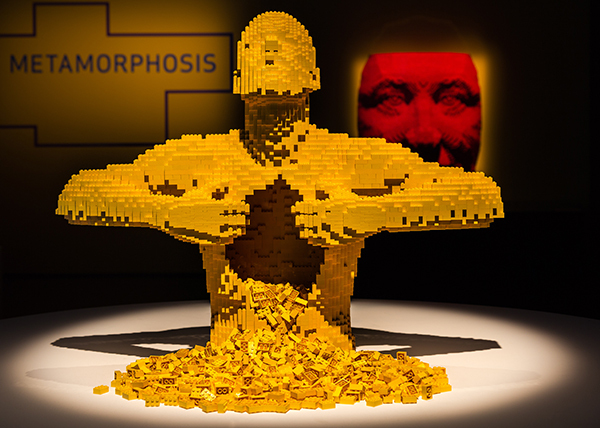 Yellow shows a human figure opening its torso with �guts,� or loose bricks, falling out. Swimmer used 10,980 bricks and took Sawaya 15 days to create the fluidity of motion and intrigue of what�s below the surface. Great design is always at your fingertips! Read Design New England's November/December 2014 issue online!